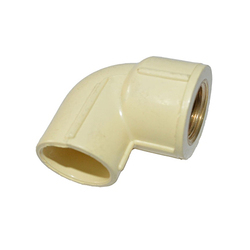 We are a leading Manufacturer of cpvc brass fta, cpvc brass mta, cpvc brass elbow and cpvc brass tee from Rajkot, India. Owing to our expertise in this domain, we are engaged in offering a supreme quality UPVC Pipe Fitting to our prestigious clients. These are manufactured using high grade raw material and progressive technology in tandem with set universal standards. 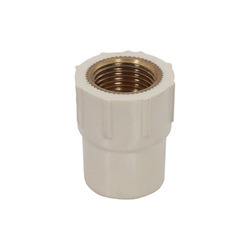 The fittings offered by us are available as per variegated demands of our clients, used in various industrial applications. Our offered fittings have gained huge appreciation for their sturdy construction & reliability. These are tested by our skilled professionals against various parameters of quality in order to ensure their flawlessness. As one of the foremost leader in the manufacturing of plastic materials, Ashok Plastic has set the benchmark in the market for excellent CPVC Brass MTA products. It is perfectly designed in various shapes and dimensions to meet the every demand of the customers. The specific brass items are made of raw materials in order to provide high grade dimension and top class quality to the estimated plastic products. The integral features of this product includes appropriate dimension, corrosion free and wide range of thermal conductivity. It guarantees the reliability and is available in low prices with the promise of high efficiency. The installation is easy and the product is having rugged strength in physical status. It can stand out the alkaline ingredients as well as the dangerous acidic substances. It is non toxic and safe to use. we are reputable name in the domain of plastic manufacturers and suppliers and it has established a tradition of quality plastic materials. In the range of high prime quality materials, CPVC Brass Elbow is the very next product with excellent features and top class quality. It is one of the best products and helps to enhance the efficiency of the pipe fittings. It is easy to install and does not assert much maintenance. 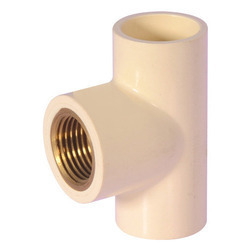 It is cost effective and fit for all the modern techniques to avail the best and reliable pipe fittings. The products have been checked entirely before it exports in the market. This specific pattern of brass elbow is robust and enough and strong in nature to carry cold and hot liquid simultaneously. It can be installed easily and provides corrosion free piping experience. With a focus on the ever-evolving requirements of our customers, we have come up with a wide assortment of CPVC Brass Tee. Our dexterous technocrats use optimum grade brass as well as cutting-edge technology in the manufacturing process of this tee. In order to ensure its quality and durability, this tee is thoroughly tested against various measures of quality in tandem with defined industry norms. Apart from this, our patrons can purchase this tee from us at market leading prices.